For optimum viewing read in 1024 x 768 using medium fonts on Microsoft Internet Explorer (best) or Google Chrome, Safari etc. The EU Directive requires Member States to take measures to achieve or maintain Good Environmental Status (GES) for their seas by 2020. GES involves protecting the marine environment, preventing its deterioration and restoring it where practical, while using marine resources sustainably. 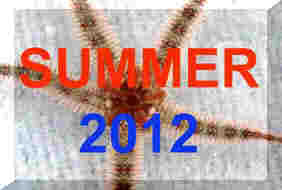 The consultation ends on 18 June 2012. 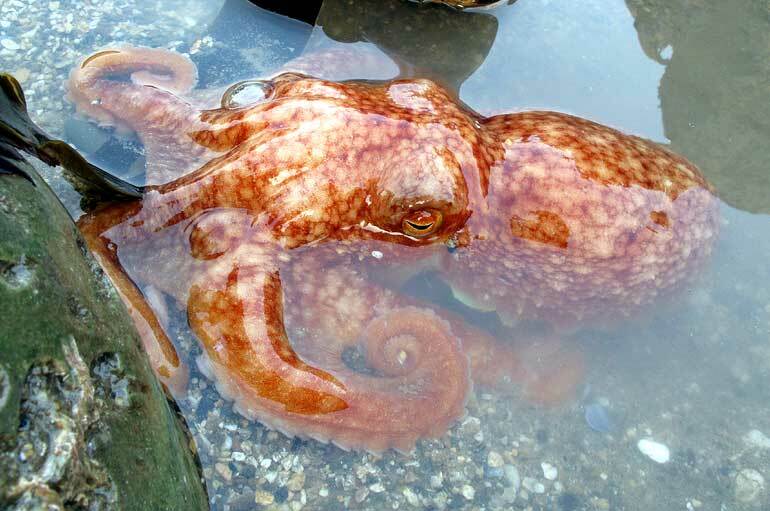 Discovered stranded by the receding equinoctial spring tide, this Lesser Octopus, Eledone cirrhosa, was high and dry at Llandudno on the north Wales coast.. I dug a shallow depression underneath it which filled with water, allowing it to breath. Initially the pupil was almost closed, but got larger after about ten minutes. A major gas leak from the Elgin platform, 150 miles off Aberdeen, has and continues to pollute the North Sea with a sheen of of gas condensate, and measuring six nautical miles in length. Total E&P UK Limited believes the leak is coming from a rock formation above the main reservoir, at a depth of 4,000 metres. 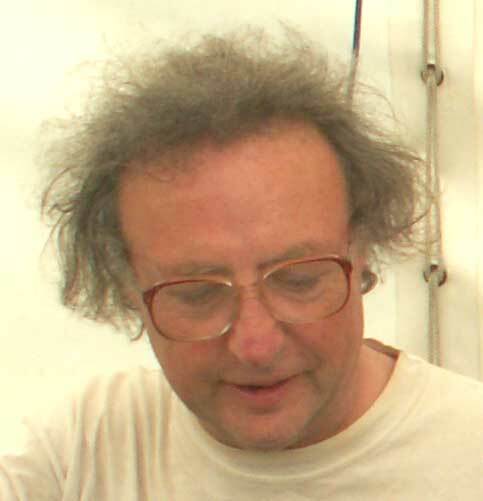 Only the second British mainland record of the or sea slater Dynamene magnitorata was discovered at Penzance, Cornwall, by David Fenwick (Aphotomarine). This very small (male > 6 mm) isopod was found on the side of a small Corallina covered rock, in a middle shore rockpool at Chimney Rocks just west of the Jubillee Pool. 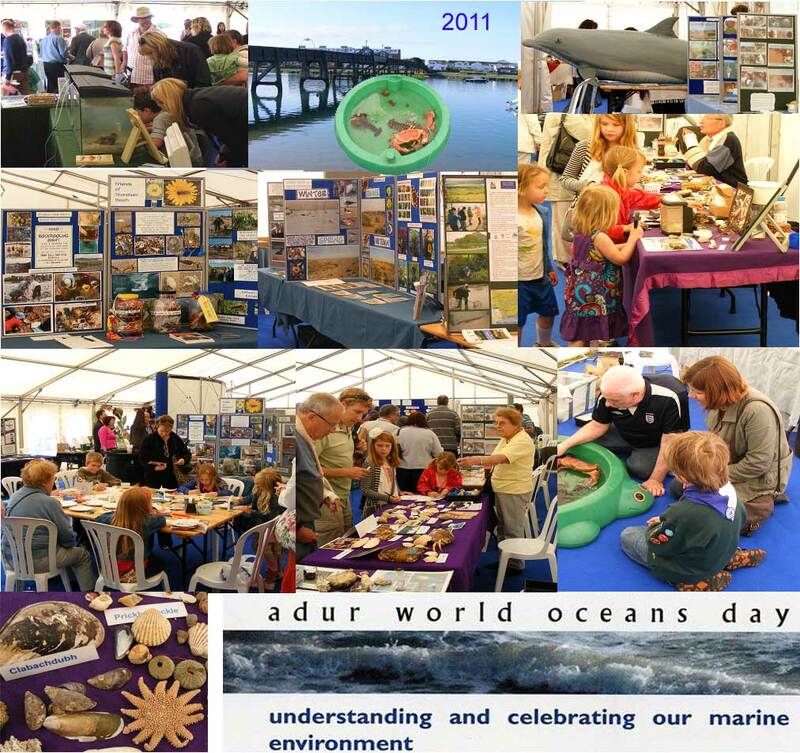 This is a southern species known from around the Channel Islands. 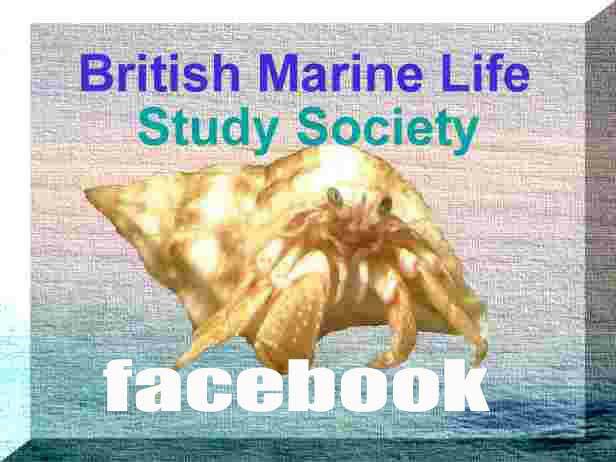 There is a close species, the dull white Dynamene bidentata found amongst barnacles on the lower shore, mostly on the western coasts of the British Isles. 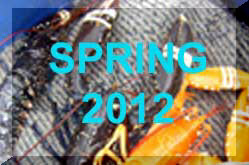 A Slipper Lobster,Scyllarus arctus, caught in a creel off Salcombe, south Devon, was returned alive. 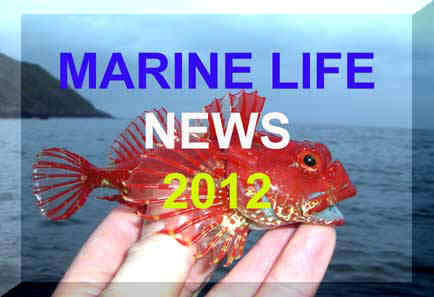 "These small clawless lobsters are a range extension species and seem to be spreading into British waters. This is about 35th I have records of and I should appreciate any other reports. 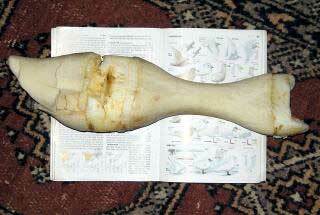 This was an ovigerous female and most females found over the last eight years have been "in berry". 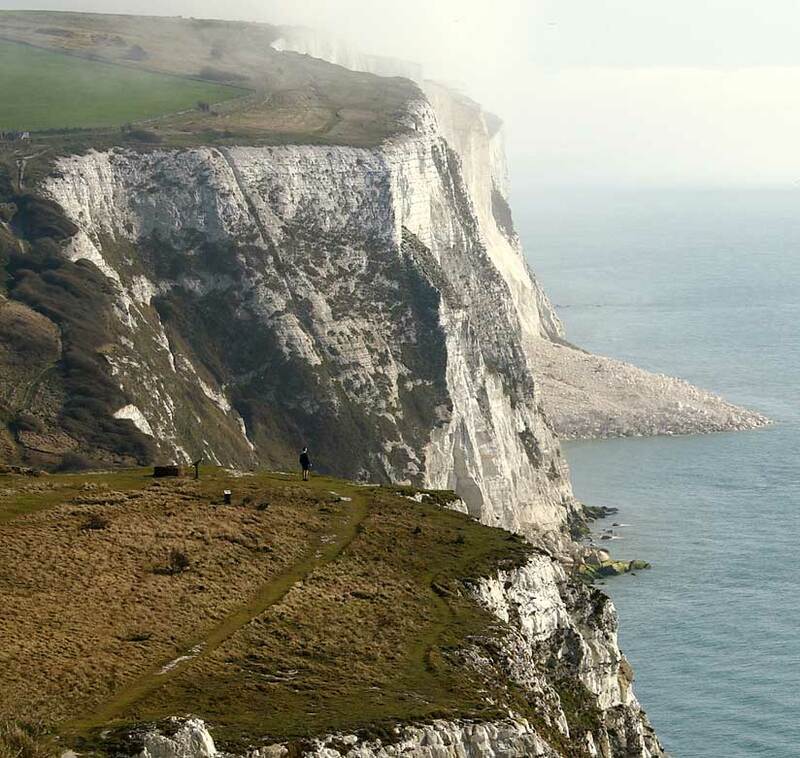 A spectacular cliff fall occurred between Langdon Cliffs and South Foreland Lighthouse on the Kent coast when an area the size of a football pitch suddenly fell away, sending thousands of tonnes of chalk crashing 100 metres down on to the shore in an area known as Crab Bay, part of the white cliffs of Dover. Three Risso’s Dolphins, Grampus griseus, were visible from the from road that skirts the northern shore of Catfirth, Shetland Islands. They surfaced every couple of minutes or so in the early afternoon. 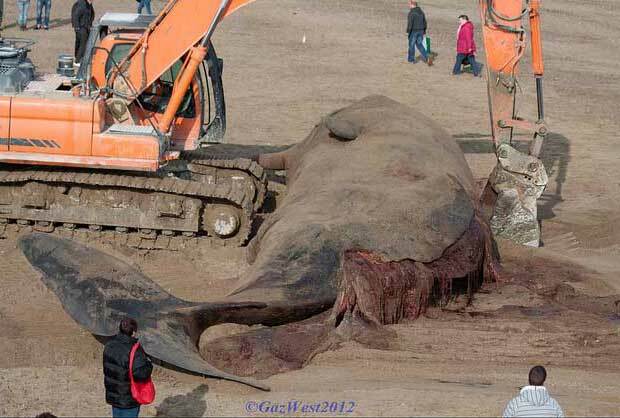 The carcass of a smelly 10.7 metre (35 ft) long Sperm Whale, Physeter macrocephalus, washed ashore on the sandy beach at Skegness on the Lincolnshire North Sea coast. 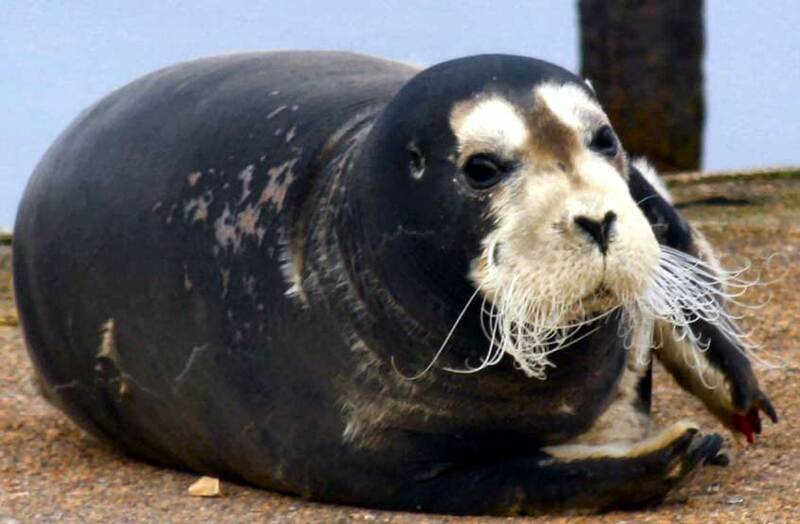 A Bearded Seal, Erignathus barbatus, was seen by lots of people on the beach at Monifieth (north shore of Firth of Tay) in the afternoon. Because of the scarcity of visits by this Arctic seal, it may be the same individual that was seen hauled out on a dock at Tayport just after Christmas 2012. It was only a matter of time before Humpback Whales, Megaptera novaengliae, joined the feeding activity off Hook Head, County Wexford on the south-east coast of Ireland, given the recent run of Fin Whales, Balaenoptera physalis, in the area. 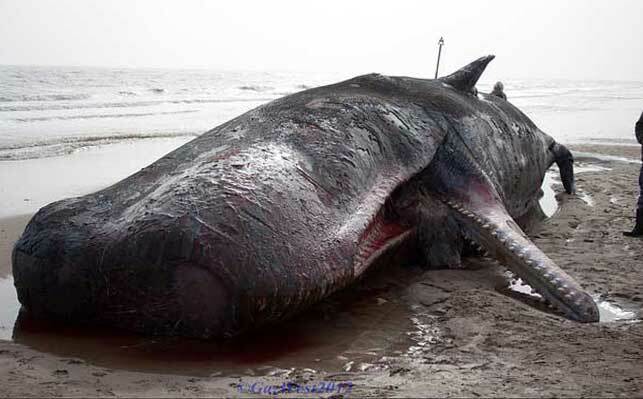 A previously unrecorded Humpback Whale, was the nineteenth individual recorded to date in Irish waters. At least six Fin Whales, Balaenoptera physalis, up to 20 metres long, were spotted swimming rapidly on and near the surface. These baleen whales were feeding on Herring off Waterford and County Wexford on the south-east coast of Ireland (St. George's Channel). 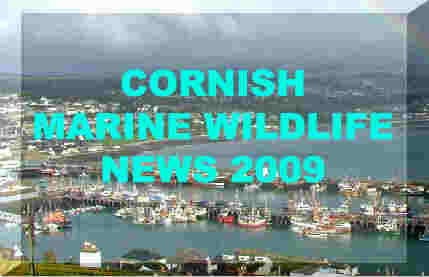 There have been regular reports from this area plotted on the map by the Irish Whale & Dolphin Group. 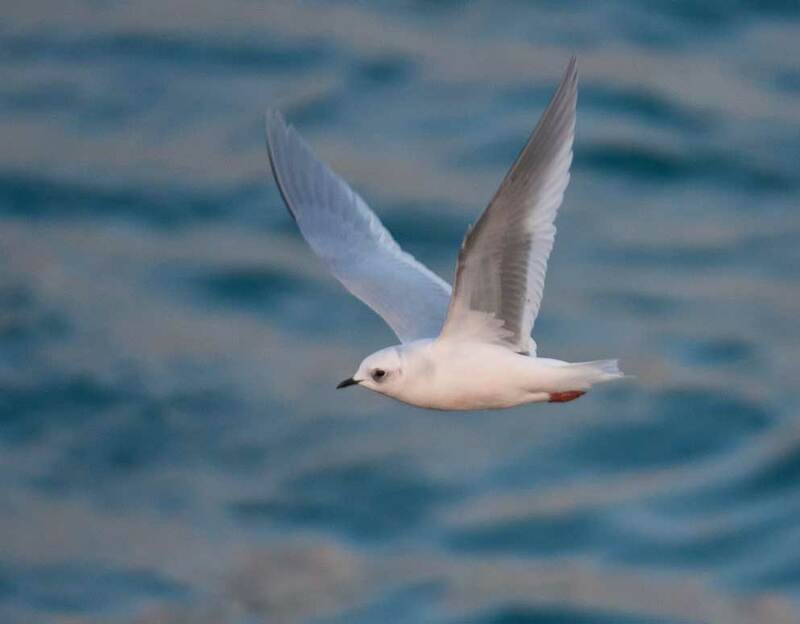 An influx of Arctic species of gulls into the Scotland and the north of Ireland and England has been notable during the coldest month of the year. A rarity was the appearance of a Ross's Gull, Rhodostethia rosea, at Ardglass, County Down, Northern Ireland. 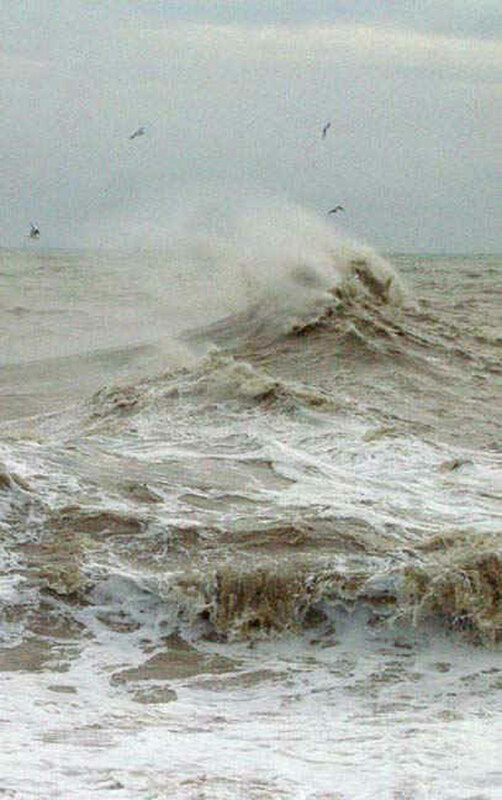 It was seen from the harbour wall at the mouth of the harbour entrance, found at 3:20 pm, and viewed until dark. This was the first Ross's Gull for Northern Ireland in 14 years. Eight Iceland Gulls, Larus glaucoides, and three Glaucous Gulls, Larus hyperboreus, were also noted. 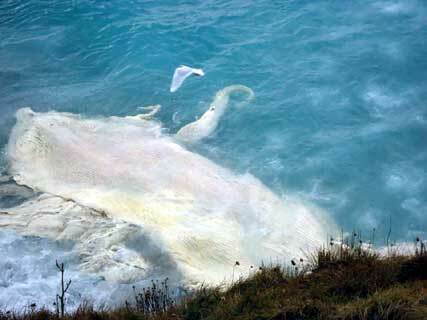 An Iceland Gull, Larus glaucoides, was attacked by an Otter, Lutra lutra, in Baltasound, Shetland Islands. There were two reports of a Humpback Whale, Megaptera novaengliae, off Aberdeen on the north-east of Scotland. 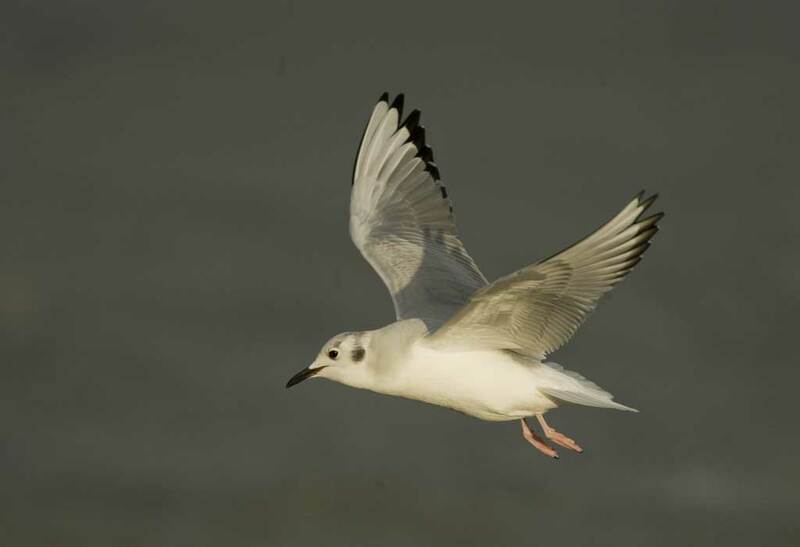 The Bonaparte's Gull, Chroicocephalus philadelphia, is the American equivalent of the Black-headed Gull. 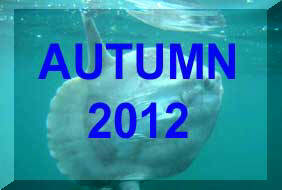 One was spotted at Ballygalley, County Antrim, Northern Ireland, on numerous (over 50) occasions. This was the first one seen in Northern Ireland since 1998. A smelly decomposed carcass of a long dead whale washed ashore by the fishermen's huts beneath the cliff at Marwick, Birsay, Orkney Islands, attracted the arctic gulls in like a magnet. Iceland Gulls, Larus glaucoides, and Glaucous Gulls, Larus hyperboreus, were joined by the far rarer Kumlien's Gull, Larus glaucoides kumlieni. "With such a large amount of carrion there is little desire to flee being shown by the birds and at times it was hard to tell who was drooling the most the feasting gulls or the throng of birders atop of the adjoining cliff." A rare American immigrant Kumlien's Gull, Larus glaucoides kumlieni, was photographed in Galway Harbour on the west coast of Ireland. 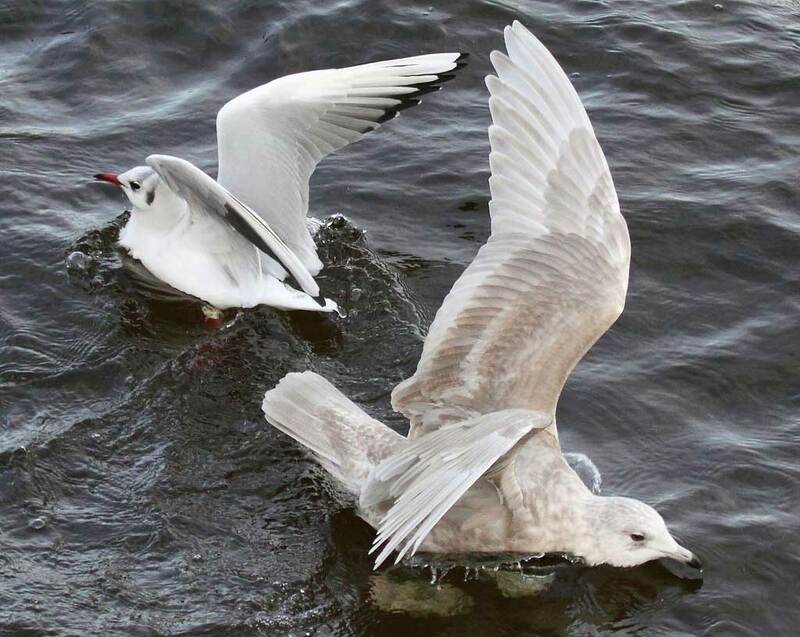 The bird on the left is a common Black-headed Gull, Chroicocephalus ridibundus. A a pod of about a dozen Risso's Dolphins, Grampus griseus, was spotted by fisherman Rodger Clarke off Abercastle, about ten miles south of Strumble Head, SW Wales. The Cardigan lifeboat responding to call to five miles north of Poppit was surrounded by a large pod of over a hundred Common Dolphins, Delphinus delphis, in Cardigan Bay, Wales, on its return. 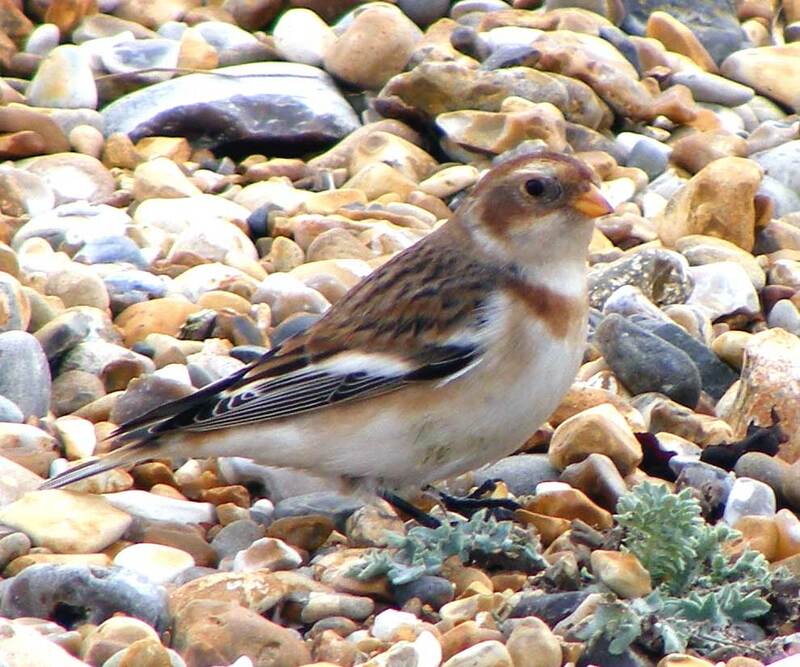 Two small Snow Buntings, Plectrophenax nivalis, were well camouflaged amongst the pebbles on Shoreham Beach, Sussex, feeding on seed provided for them and attracting a handful of birdwatchers with telephoto lens. Snow Buntings are a very scarce winter visitor and passage migrant to the Adur area. 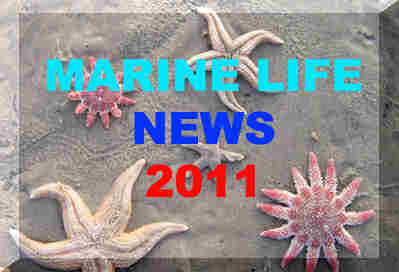 These birds were first reported on 27 November 2011 and were still around on 17 January 2012. A three metre long shark was spotted cruising the shallow seas off Exmouth in south Devon. The shark seen off Exmouth is not a Blue Shark, Prionace glauca, but a Basking Shark, Cetorhinus maximus..
An adult female led one immature whale and two even younger whales from the south west tip of Shetland at West Voe round to the east of the islands, swimming up to Sound of Mousa where they were last seen in the afternoon as it got dark. Shetland Wildlife tour operator Hugh Harrop said "the most exciting part of the experience was observing the two youngest whales catching small birds, an unusual but not unheard of spectacle. We witnessed the two young ones turning on a sixpence, diving and slapping their tails and watched a Long tailed Duck (or 'Calloo' ), Clangula hyemalis, come to a bitter end." An Iceland Gull, Larus glaucoides, was photographed on Shoreham Beach, on the seaward side of the west arm of the harbour from late morning to 1.15 pm. The Iceland Gull is a very scarce winter visitor and passage migrant to Sussex. A two metre long Blue Shark, Prionace glauca, was washed up alive on to the beach at West Bay, Dorset, and hauled back into the water by Jeannette Longley, but it was found dead on the shore at Burton Bradstock shortly afterwards. A young Kemp's Ridley Turtle, Lepidochelys kempii, was discovered on the shore at Tresilian Bay, near Llantwit Major, on the south Wales coast. 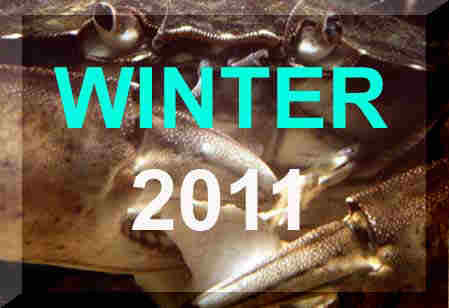 This was the second of these young turtles discovered dead after the gales since Christmas 2011. These endangered turtles breed on the coasts of Mexico and are usually found in the Gulf of Mexico and were thought to have blown across the Atlantic Ocean. The turtles are likely to have perished in the cold seas.